Demonstrators march through downtown Chicago on Tuesday following the release of a video showing Jason Van Dyke, a police officer, shooting and killing Laquan McDonald. Van Dyke is charged with first-degree murder for the October 2014 shooting in which McDonald was hit with 16 bullets. So far this year, 15 officers have been charged with murder or manslaughter resulting from an on-duty shooting. NPR&apos;s Ari Shapiro talks with Jamie Kalven, co-founder of the Invisible Institute, which with the University of Chicago put together a database of police misconduct in Chicago. 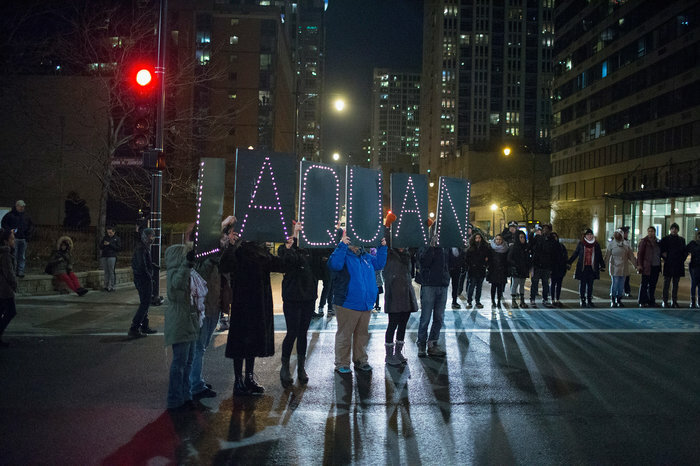 Read more of our coverage of the Laquan McDonald case.